I spent another week in Macleod, and although the jetlag is still wearing me down (probably not helped by the lack of routine and focus, namely any form of employment at present), I’m starting to feel more settled and at ease with being here. In fact, I’ve really enjoyed being in Macleod as it feels like such a nice, quiet, and safe area. The homesickness comes in waves, but for the most part I find that focusing on all of the new experiences I’ll be able to have here and the people I’ll be able to meet distracts me just enough. I am definitely missing home comforts, and it pains me that it’s Winter here whilst it’s in the high 20s in England! One evening I went into the city to meet an old school friend, Kyle, who I hadn’t seen for around eight years; it was really great to see a familiar face and to catch up with someone else from home. We went to a swanky little bar on the river next to Flinders Street Station, and had a few drinks. I’m yet to properly explore the city and what is around as I’m still finding my bearings, so it’s nice to discover places through the recommendations of others. Annoyingly, not everywhere serves drinks in pints and so I have to settle for a schooner, yet the price seems to be the same! It's certainly expensive drinking out in Melbourne. After a few drinks, we went to a rooftop bar which also functions as a roof-top cinema. We sat and had a few more drinks and ordered some food from the burger bar, which I was most impressed with - sometimes you can’t beat a simple burger and chips! The next day I decided to jump on the train to go to a little town called Ivanhoe, which I had discovered last week and really liked. I went for some wood-fired pizza for dinner, and am finding that I am loving the opportunities to eat alone and spend time catching up on reading, something I used to do for a couple of hours a day at home, but haven't done much whilst I've been here. I had intended most days on going for a run, as it's something I usually love doing at home. However, with my sleep completely topsy-turvy my motivation has been lacking, and I've not much wanted to get out running once it's dark. On Thursday morning however, I finally managed to wake up at a reasonable time and took myself out for a run. Thanks to the joys of GPS, I just decided to run without considering where I was going, then rely on the GPS to find my way back. It was a good way to explore the area, and I also discovered a walking track just ten minutes behind where I was staying. I had briefly considered whether there might be kangaroos lurking around, but then chastised myself for stereotyping Australia and forgot about it. However, on my way back two girls (who spoke little English) stopped me to ask where they could find the kangaroos. Cue my befuddlement and telling them that I did not know and I had not seen any. That evening I spoke to Suzi (owner of the Air BnB) about it, and she told me that there are indeed mother and baby kangaroos roaming around, most loitering on the boundaries. The male kangaroos are held behind a large fence because they are too dangerous to be roaming around! I was most disappointed that I had not managed to see any 'roos, but also most surprised that they can be found in such a suburban area. I enjoyed having a nosy whilst running around the area, as there were some seriously swanky properties! On Saturday morning I moved into my rental house in Brunswick with two Australian girls, Caitlin and Laura, who have already been living there for quite some time. I managed to get myself an Uber for about $3 for a 40-minute journey, thanks to an accumulation of discount codes! I was surprised to find how much stuff I had accumulated in just two weeks, due to having to buy all the items I hadn't had room to pack in my suitcases on the way over. The girls had very kindly left me a 'Welcome to Melbourne' gift with essentials including wine and TimTams! Saturday lunchtime we went down the road to Laura and Caitlin's friends' house for a 'bottomless brunch'. We all took an item of food and contributed to the breakfast (which was absolutely delicious), and filled our boots with prosecco. It was really nice to meet a few other English people, and just to be around a group of girls. It's going to be hard to start a whole new social circle in a new country, so occasions like this I am so grateful for. I'm also very pleased that bottomless brunch is very much a thing here! On Friday night I took the train over the Brunswick to meet Caitlin and Laura, my soon-to-be housemates. Before coming over to Australia, I was getting stressed about all the things I would have to sort out once I arrived, and so decided that anything I could sort out beforehand would be a bonus. I therefore took the risk of finding somewhere to live without viewing it first, and so met Caitlin and Laura, and viewed their house, after Skype! After getting the house and having a quick look around, we got ready to go out for my ‘Australian Initiation’. We went down the road to a Thai ‘BYO’(bring your own bottle) restaurant, something which seems to be a pretty common thing here. We stopped off at the ‘bottle-o’ (it seems I have a lot of Australian lingo to learn in order to eventually understand what everyone is actually talking about!) for a few bottles of vino, and had a nice civilised dinner. Brunswick is often described as the ‘hipster’ area of Melbourne, full of share-houses, with lots of bars, restaurants, and cafes - I’d liken it to Camden. After dinner we went to a pub, where I was very pleased to see that they serve my favourite cider - a little glimpse of home which was much appreciated! The first stumbling block however was the drink sizes; did I want a pot (half-pint) a schooner (between a half and a pint), or a pint? I was then told that in other states of Australia, the sizes would be called something different again. After a few civilised drinks, Laura suggested we head over to Fitzroy, which seems to be the place to be if you want to stay out late or go clubbing. We caught an Uber and went to a club called Perseverance - I realised that Australians will abbreviated absolutely anything, when everyone referred to the place as ‘Perso’! Having all felt pretty sober, the drinks started flowing at ‘Persa’ and before we knew it, it was around 4am. I learned that firstly I have no idea how to use Australian coins, several times trying to pay with the wrong denominations (the coin sizes are all wrong! ), and secondly that Australian clubs stay open super late. When I’ve had a drink it seems that everyone is my best pal, and so I got chatting to a lot of people, and everyone had plenty of advice for me about things to see and do in Melbourne. Everyone is so friendly and so willing to help. After Persa we went to another club until close at 6am (apparently this is a normal time for clubs to close!) before going back to an after-party at an apartment of some people that Caitlin and Laura had met. My camera roll is full of pictures of random people I got talking to, including the one above, and for some reason all of them seemed to have beards. I’d like to say that I saw a lot of Brunswick and Fitzroy, and that I have lots of pictures to show for it, but unfortunately none of the pictures are worth sharing! At least my introduction to an Aussie night out was a good one. Staying awake so late wasn’t a problem for me given that I still haven’t managed to get myself synced up to Australian time, but by 8am I was ready to go to bed. I got a taxi back to the house and spent my first night in the new house. Laura has a cat, Tux, and I couldn’t recall whether she had said whether he is a house cat and allowed to go out or not, so when I opened the front door and he ran straight out, I realised I wasn’t going to be falling straight into bed. Tux decided to run straight under the neighbour’s house, cue me running around after him and trying to entice him out. Given that the cat doesn’t actually know me, this was quite a task! He eventually came home though, and I could get to sleep. Thanks Tux. After another day of sleep (this time 08:30 until 16:30), my whole day of plans went completely up the spout. I managed to sleep through my alarm, which never happens, so I must have been tired. I’m trying to listen to my body and sleep when I need sleep as I’m trying to minimise stress, but as of tomorrow I’m on a mission to fight the jet lag, and synch with Aussie time as opposed to English time! The only positive is being on the same time zone as everyone at home means I can still chat to everyone at a normal time for them. On the way back from the city yesterday I noticed quite a few towns along the train line, which looked like they might be nice places to visit. One of those places was Ivanhoe, and when I looked it up it seemed to have a lot of independent restaurants. I thought it would be a good idea to get out and get a hot meal, having not eaten anything hot since being on the plane on Monday morning. Despite there being so many restaurants, the majority were wood-fired pizza places (in fact three right next door to each other) and so pizza it was. It was nice to sit in a restaurant window and just watch everyone going about their business and catch up on listening to a few podcasts. Even better, now that I’ve sorted my mobile phone out I can actually use data and chat to people at home whilst I’m out and about - it makes dinner out alone seem much less lonely! Being here now I can’t help making comparisons to when I last came to Australia a decade ago; back then I had no access to the internet other than to use internet cafes and public libraries, and had to stick with using Lonely Planet guides and maps, and asking locals for directions. Contact home had to be via e-mail at the Internet cafe. It was a completely different experience, and although having the internet at my fingers all day long gets rid of a lot of the anxiety of getting around and looking up train times etc, it also takes away some of the challenge of the experience, which I really enjoyed. I felt such a sense of achievement first time around, although this time it’s a challenge in a very different sense. Everything these days is so instant, and I do miss the simplicity of a time when we didn’t have the internet so readily available. Tomorrow I will be going to Brunswick for the night to meet the two girls I will be living with, and spending the night at the house I’m going to be renting (I won’t be moving in until the end of next week). It will be nice to explore the area that will hopefully become a more permanent home, and meet the girls that have committed to living with me without having met me yet - either they’re brave or stupid! I’m hoping that having a few drinks and meeting some new people will help to make me feel more settled and at home. Whilst I’m waiting for my TSS Visa and AHPRA registration to come through I am going to make good use of all of this time off and enjoy myself, with a hangover or two along the way! Another sleepless night last night, definitely not helped by my sleeping until 5pm yesterday! I’d set my alarm for 10am this morning in order to go into the city, but at the point that horrendous noise reverberated around the room I’d just got back to sleep and felt like hurling my phone through the window. I dozed for another hour or two, and then realised that I was yet to see any daylight since arriving, and if I got up and about then hopefully I’d sleep better. I’m feeling insanely homesick, and therefore it feels easier to luxuriate in bed and sleep or read than to get up and face the world. I have to keep telling myself thought that it WILL get easier, and that right now I am pretty much alone, and so it IS going to be hard until I actually meet people. The walk through Macleod to the train station was what I can only describe as walking through the set of Neighbours! So stereotypically Australian and quiet. The train into Melbourne Central is about 40 mins from Macleod (which I have now learned, since embarrassing myself at the ticket booth, is pronounced ma-cloud and not ma-cle-od. Fortunately it pulled up just as I paid for my ticket, which saved me quiet a wait. I’m feeling rather overwhelmed by all the changes I am having to face at the moment; after having a routine at home for many years, I had taken for granted so many of the little things, such as knowing which brands to buy at the supermarket, roughly how much things are going to cost, and approximately where most places are in relation to work or home. I hadn’t expected to get myself into a tizzy just trying to work out what a bottle of semi-skimmed milk looks like or is called, or how much a box of cereal equates to in pounds. Given that I am trying not to work myself into an absolute frenzy of stress, I have decided it would be best to give myself something small and achievable to do each day in order to get myself out and about and exploring Melbourne, without the stress of trying to squeezing too much in. I have plenty of time to do things whilst I’m waiting to start work, so there’s no hurry. Today’s challenge was to set up my Commonwealth bank account, which was easy enough as I had already applied online two months ago and had my bank card sent to the Flinders Street branch to pick up. I was also relieved to see that the transfer of funds that I’d sent from the UK a couple of days ago had made it into my Australian bank account with no issues; surprising given that I did not really know what I was doing! Everyone is so friendly and helpful here, and the ‘How you doing?’ seems to be a question of genuine interest rather than a generic greeting. Everywhere I’ve been today people just wanted to talk, ask lots of questions, and give lots of advice about Melbourne. All much appreciated at this point of course. I had planned to get a new mobile service plan in a few weeks time when I’m more settled, but I realised today how much I am going to be relying on Google Maps, and data would help greatly with that. There’s only so much you can do with the free WiFi! There was a Telstra shop just down the road from the bank, so I decided to go in and find out about the service plans. The guy in the shop was explaining to me that the internet in Australia is generally pretty slow, and that costs for mobile plans are rather expensive. The cheapest I could get for what I needed came to the equivalent of about £25, when I pay £12 at home. It’s dawning on me that life here in Aus is going to be more expensive than at home, which I was honestly not expecting! I spent the rest of the afternoon wandering around the shopping malls (both of which I managed to get in to but somehow couldn’t find the exits for, like some kind of labyrinth...) and just bumbled around, trying to find my bearings. I last came to Melbourne ten years ago and although I spent five days in the city, I feel that there is so much more for me to explore and now with a completely different perspective. I intend to make the most of being a tourist before I have to start work, given that I have no idea how long that will be. I went past Fairfield on the train, where my new workplace is based, and I was pleased to see that it seems like a really modern and clean area. The trains seem pretty reliable and so hopefully I’ll be able to get by quite easily without having a car, although it will be quite an adjustment! As for tomorrow, I plan to stay in Macleod, go for a run around the local area, and perhaps visit the library to sort out some bits of ‘life admin’. Here’s hoping tonight will be bring me a better night’s sleep. I think I could very easily say that this week has been one of the most stressful of my life. Trying to sort my belongings into two suitcases and hand luggage seemed an impossible task, and very nearly ended in a hefty oversized baggage charge; fortunately the kind lady at the baggage drop-off let me off the charges as I was only 3kg over when my luggage weights were combined. Earlier this week I got asked to send more information for my AHPRA application, as well as complete another police check for my visa application. It has seemed like a constant (and never ending) stream of requests for further information and payments, but at long last I have arrived. Not only has this week been pretty high on the scale of stressful events, it has also been an absolute rollercoaster of emotions, mostly sadness and worry accompanied by streams of tears. I am overwhelmed by thoughts of all the things and people I will miss and struggled to say goodbye to (mum and dad especially! ), and at the moment am struggling to focus on the positives, but hope that in a few weeks that may change. I recognise that it may take quite some time to settle in, and am prepared for more tears! Following my Saturday night 21:55 flight from Heathrow to Hong Kong, my connecting flight to Melbourne landed at 07:20 this morning. It wasn’t all plain sailing as I was so distracted by how upset I felt, that I went through security at Heathrow and all the way through duty free before realising I had left my cabin bag behind. Fortunately when I ran back it was still there, although I had visions of the bomb squad being out to reports of ‘unattended baggage’! I managed to sleep a fair amount on the first flight, thanks to having a window seat, however the second flight from Hong Kong to Melbourne - not so much. By the time we landed I was pleased to be back on land, although rather panicked when my suitcases were the last to arrive. Funnily enough, the exact same thing happened the last time I was in Australia! I have booked two weeks to stay at a homely Air BnB in the suburbs, in a little town called Macleod. A sleepy little place which will hopefully allow me plenty of time to unwind, get over the jetlag, and find my bearings. I hope to see these two weeks as a holiday to unwind from the stress of the last few weeks, and will take a few trips into the Central Business District (CBD) in order to set up my bank account, enrol in Medicare, and familiarise myself with the area. No doubt I will have to buy all of the things I have likely forgotten - or haven’t had time - to pack. I have various things to sort out, such as getting a new phone contract, sorting out my tax file number, and finding a new gym, so hopefully I should have enough to keep me busy. I arrived to rain and wind, not exactly the weather that people envisage when they think of Australia! I had considered trying to get an Uber, or tackle public transport, but thanks to the weather, my tiredness, and the amount of luggage I had, I decided to take the hit and pay $61 for a taxi to Macleod, where my Air BnB is. Monday was spent in a cycle of sleep, wake, read, sleep, wake, read. I had hoped to get out to the shops to pick up some food, but given that it was dark when I finally woke in a functional state, I decided to just go back to bed hungry and get on with things in the morning. That didn’t quite go to plan when I woke up at 17:00 today! I obviously needed the sleep, so I am not going to be hard on myself for wasting a day. I walked to the nearest supermarket, which was about a 25-minute walk, and had a slow wander around the neighbourhood. Macleod seems like a lovely, safe, suburban area, and I’m looking forward to exploring it in the daytime and finding a running route. Depending on who you talk to, some will tell you to complete your visa application first, whilst others will tell you to go for the Australian Health Practitioner Regulation Agency application instead (AHPRA - The Australian equivalent of the NMC). I did the visa application first, with the idea that the visa was cheaper to apply for and if I got declined, I'd have saved myself paying the hefty AHPRA fee. The Working Holiday Visa (WHV) is a year-long visa that you can apply for until the age of 30. Once approved, you must enter the country before your 31st birthday. If you wish to extend your visa to a second year, then you need to do 3-4 months of agricultural work and apply for your second year WHV before you turn 31. This visa allows you to travel around whilst working, but means you can only work in one job for a certain amount of days / hours (somewhere around 500 hours I think). If you are planning to undertake work in health care whilst on your WHV, you will most likely need to undertake a medical. The medicals can only be performed by licensed panel physicians (I had to go up to London for mine) and are pretty pricey. At first glance, the AHPRA application looks incredibly overwhelming. And to be honest, it really is. Before I could submit mine, I spent around three months firing e-mails all over the place, gathering information, and spending money to get the information I needed. Not only that, but a lot of the time I found myself getting nowhere and wanting to pull my hair out with the stress of it all. I was bounced from pillar to post and at times waited weeks on end for responses. The best advice I can give for the AHPRA application is to allow yourself plenty of time to gather all of necessary information, and be prepared for possible delays in getting hold of said information. You will need to gather statements of service from all of your previous NHS trusts, however there are stipulations as to what the statements should include, and you can find a template for this on the AHPRA website. AHPRA can be very pedantic as to what they require (in fact, mine were rejected and I had to get new letters written up) and must all be hand-signed. You will need proof that you have been taught in English, so that will involve a letter from your school or college to verify that you were taught and assessed in English, and the dates you attended. You need to provide certified copies of your academic certificates, which means you either need to find a Justice of the Peace who can sign and certify them for free, or find a 'notary public' to do so at a cost. Notary publics will quote vastly different prices, so it's best to ring around. I had quotes from between £80 and £200. As well as certified copies of certificates, you will also need to get transcripts sent from your university directly to AHPRA (if you choose to have the transcripts sent directly to you, you will have to get them certified and if using a notary public, this will incur additional costs). Most universities are au fait with this process, and will complete a pack consisting of summaries of modules completed, placement hours, and your transcripts. Unfortunately the price of this seems to vary between universities. Working in the NHS, I have never had to complete a CV, as I have always used the very user-friendly NHS Jobs website. However, for AHPRA you will need a full CV following their specified format, so it's best to get started on that as soon as possible, as you will need to gather information on any extra courses you have completed, as well has relevant skills you have pertaining to the jobs you will be seeking. Finally, you will need to apply for a Certificate of Good Standing (COGS) from the NMC, which they will send directly to AHPRA. Once you have your AHPRA 'Offer in Principle' you will need to present in person to an AHPRA office to show your ID documents. You will have three months to do so, and therefore need to consider when submitting your application how long it might take and when to book your flights. You might need to think about how long your period of notice is, as you want to arrive in Aus before the three months is up. You may need to apply for a Fit2Work police check as part of your application; AHPRA will only accept police checks from specified companies. Unfortunately my AHPRA application got lost in the post for two and a half months, having sent it tracked with Royal Mail (an experience that nearly put me off the entire process). I have since looked into other ways of sending the documents, and plenty of people have confirmed that DHL seems to be the most reliable, arriving in Australia within less than a week. University Transcripts - £25 for one university, £50 for the other. Once your application process is complete, you will of course have to factor in flights, travel insurance, and accommodation, amongst other costs. I have been fortunate enough to secure sponsorship, which means the visa application is around £1300 and I also need an additional police clearance certificate costing £45. 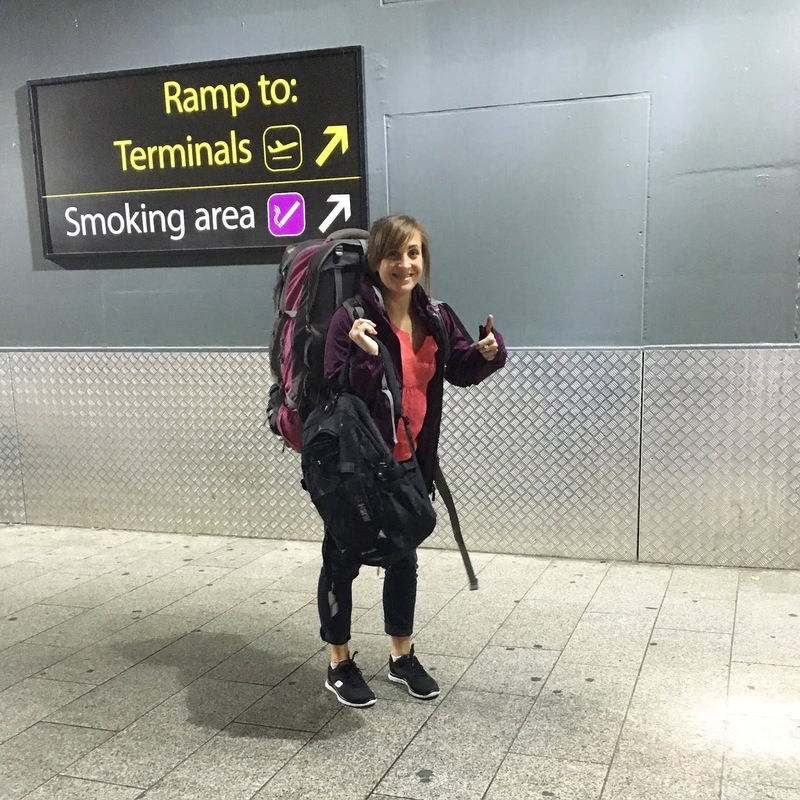 The pros of going to Australia on a sponsorship means that I can stay for four years without having to do farm work, and I can get settled into a routine, working in the same place long-term. For some people, being able to travel around Australia is preferable, so you may wish to give consideration as to whether you look for sponsorship opportunities or pursue the WHV route. If you have any questions about the process I would be more than happy to help - I asked countless questions of strangers on Facebook and it couldn't have been more helpful! The last couple of months have really flown by, and now I find myself just a week away from 'the big move'. When I first booked the flights last year, June 2018 seemed so far away that I kind of convinced myself that the time would never arrive! But here we are, and my thoughts and emotions are all over the place. Perhaps the biggest thing for me at the moment is that I am now, for the first time in my adult life, I am unemployed. I no longer have a steady income from a full-time job, and have no idea when I will be starting my next job. Although I have a job lined up in a forensic hospital, my start date entirely depends on how long it takes for both my sponsorship visa and AHPRA registration to be confirmed. I already have a working holiday visa which allows me to stay in the country for a year, and would allow me to pick up some temporary work, however the minute my other visa is confirmed, the working holiday visa becomes void. This leaves me in quite the state of worry regarding how long I am going to be unemployed and how far I can make my savings stretch. The last week has unfortunately involved a lot of big sums of money leaving my account, such as for my visa, the bond for a place to live, fees for my air bnb where I am temporarily staying, and other chunks of money which have all acrued to cause me more stress! The uncertainty of not knowing how long I need to live off my limited savings means I can't exactly budget, and will be living rather frugally. Not exactly how I had envisioned my exotic arrival in Australia! Packing for a holiday is one of my most-hated chores of all time. I never know what I want to wear that day, let alone of the rest of the week or fortnight. The added challenge here of course, is packing to move my entire life 9,000 miles away within just two 23kg suitcases. I have no idea where to begin with packing for both Summer and Winter, work-wear, gym-wear, essentials, and whatever else I need in order to not feel like a complete nomad when I get there. It's causing me an almighty headache! I joined a new gym in December as soon as it opened, and have been there almost daily ever since. I adore the classes, I've got to know the other members and the staff, and it feels like a rather dysfunctional home from home. I've never enjoyed exercise more, and the class timetable fits well with my life and keeps me motivated. Although I can walk straight into a gym in Melbourne as the same chain exists out there, it will be a completely different experience. Will the classes be the same? Will I gel with the people? I also enjoy running and have myself several running routes that I know well around where I live. I'm actually quite looking forward to finding my way around the Melbourne suburbs, and running will be a great way to do that. A biggie here, but starting a new life so many miles away means incessant worries about whether I'll meet people I get on with, whether they'll like me and my Pommie ways, and whether I'll be able to get into a nice work-life balance out there in the same way I have developed here. I feel like I am starting a completely clean slate and although that's in some ways quite exciting, it's also rather terrifying!